Although it’s still July, the summer is flying by and the high holidays will be here before we know it. I’m thinking of buying a new challah cover this year and I’ve been looking online for options. I searched through many images of covers and came up with five of my favorites. When I checked to see who the artists were, I was amazed to discover they were all by the same Israeli artist, Yair Emanuel. 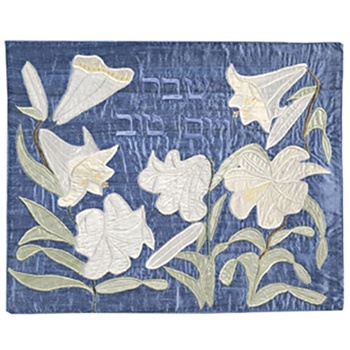 His challah covers are designed by means of raw silk appliqués, joined to the cover’s fabric with embroidery. They are decorated very colorfully, using multicolored, silver and golden silk embroidery threads. The Barley Raw Silk Applique'd cover below, is probably his most masculine. 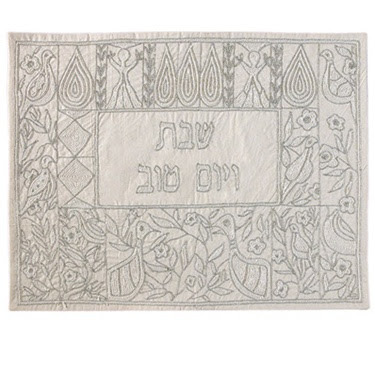 It's embroidered in Hebrew with the words Shabbat and holiday. Barley is one of the seven species that the land of Israel was blessed with. The Challah cover is a very appropriate addition to Shabbat dinner as we recite the blessing over the bread. 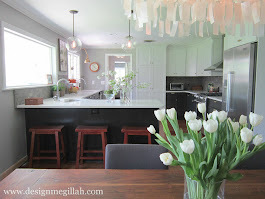 A more feminine side of his nature is the White Flowers Challah Cover below. 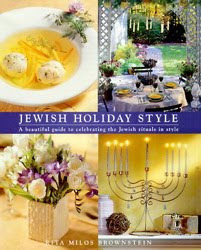 Illustrated with lillies and accompanied with the words Shabbat and holiday (Shabbat ve'yom tov). Another favorite of mine is the Creation-Inspired cover below. 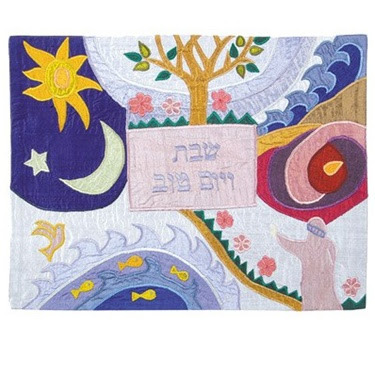 It depicts different torah passages and has more of an arty vibe. 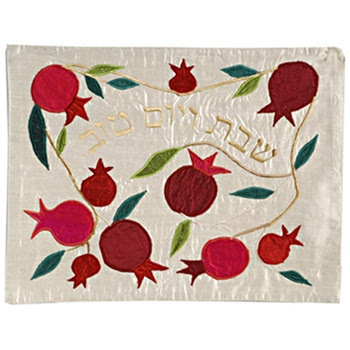 The Small Pomegranates cover below, is perfect for Rosh Hashanah. Pomegranates are one of the symbols of the holy land which also represents wisdom and abundance. 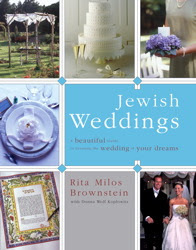 The extraordinary contrast of colors makes this Challah cover strikingly beautiful. And last but not least is the Hand Embroider Geese Parsian in Silver. Here the artist uses chain-stitched hand embroidery on raw cotton using various colors of silk, as well as gold and silver threads to create a stunning design. 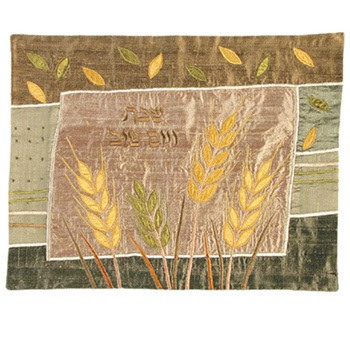 It's decorated with a beautiful motif of geese and plants, at the center of which are the works "Shabbat Ve Yom Tov" (Shabbat and holiday) in Hebrew. 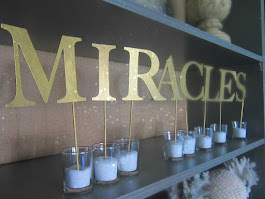 The design is embroidered in silver thread on the off white cotton. It's so hard to choose--any thoughts?